The Discoverers is for children aged 3 1/2 to 4 years, we have a maximum of 16 children to 2 members of staff. The children move in to the l room usually in the Summer after they turn 3 years, this room is the foundation room in preparation for Reception Class in primary school. Mark Making - Children can use a variety of materials to draw, paint, or stick. Number & Problem Solving - Children are introduced to simple number work and problem solving skills. Small World - Children here can interact with other children different scenarios they may may have come across. Imaginative Area - This could be a coffee shop, a doctors surgery or a classroom and allows the children to use their imagination using role play. Quiet Area - Children can sit quietly and read books or some children just want to have a rest from the busy day at nursery. The Discoverers are lucky enough to have access to its own garden which gives the children full access to the outdoors, children also play in the main garden with the other children within the nursery and their siblings. 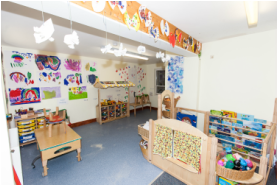 The preschool has a lot of free flow play and are able to flow into the main area along with the Explorers which allows them great access to further activities, toys and games. It also makes the transition into the room run smoothly as the children are continuously building relationships with all of the staff. we encourage a grown up approach teaching the children to have responsibilities, At weekends they are allowed to take a book home to read from the "Oxford Reading Tree Scheme" they can read this book with their parents and is a start into the preparation to school. These books encourage the children to talk about what they have seen and how stories are structured, familiar letters and words, and reappearing characters. We have a home-link book in which children can take home each week and record what they have done over the weekend with the friends and family and where they have been. We like this to be returned on Monday as it is used in group time and allows the children to share their experiences with their friends. we like to hold various events through out the year and love getting the parents actively involved. Some of these events are centered around seasonal dates such as Easter, Divali, Chinese New Year, Mothers Day, Fathers Day as well as other parental lead initiatives. This in the past has included some parents coming in to talk to the children about their work place, or where they are from.